Over the years, I’ve used several ways to choose random destinations. In this blog post, I share my experiences of random travel and compare different destination pickers. Besides sharing my own methods, I’ve also listed other destination randomizers that you can use for your travels. And at the end of the post, you can even try a random destination generator that I created! My dart throws from summer 2012. Throwing or dropping darts is probably the most classic way to choose a random travel destination. I employed this method on my first InterRail trip in 2012. 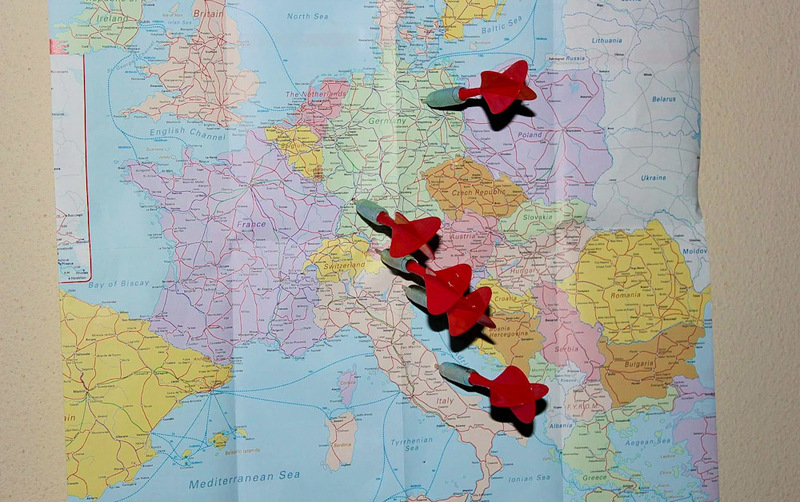 As I was preparing for my trip, I bought a set of five darts and threw them all at the map of Europe. Because I had only three weeks to travel, I kept my eyes open and roughly aimed in Central Europe. The darts landed near Wittenberge and Karlsruhe in Germany, Feldkirch in Austria as well as Bassano del Grappa and San Benedetto del Tronto in Italy. Some of those towns are very small and obscure, so the method definitely helped me to step out of the beaten track. Pros: Throwing darts is fun and cool. Cons: Map projections skew the odds. It’s hard to make a dart throw completely random. The results of my destination poll from November 2017. 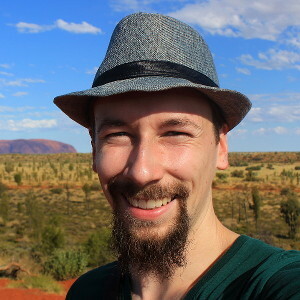 In 2013, I had a Finnish travel blog/project called Unelmien tiellä (“On the Road of Dreams”). Me and my travel companion Olli traveled around Europe for 20 days, asking 1000 locals to write or draw their dreams for the future on postcards. The cards were posted online and later presented in some exhibitions around Finland. While traveling in Europe, we sometimes let our Facebook followers choose our next destination. We gave them a few options to choose from and we headed to the place that first got certain amount of votes. 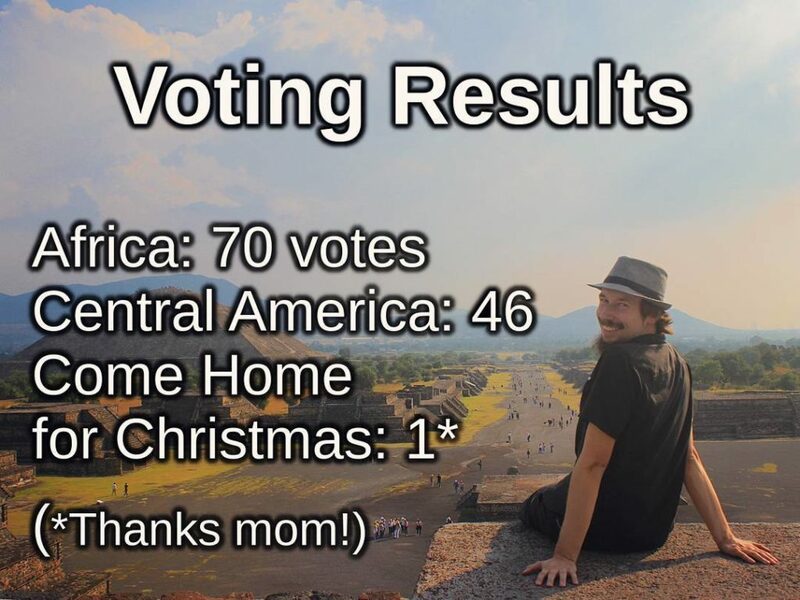 I also used a similar poll during my current 2-year trip around the world when I let you choose my destination between Central America and southern Africa. I’ve really enjoyed this method on both trips and it might just be my favourite way of random travel. Pros: Getting others involved with your trip is fgreat. You can pick the possible destinations. Cons: You need an audience. 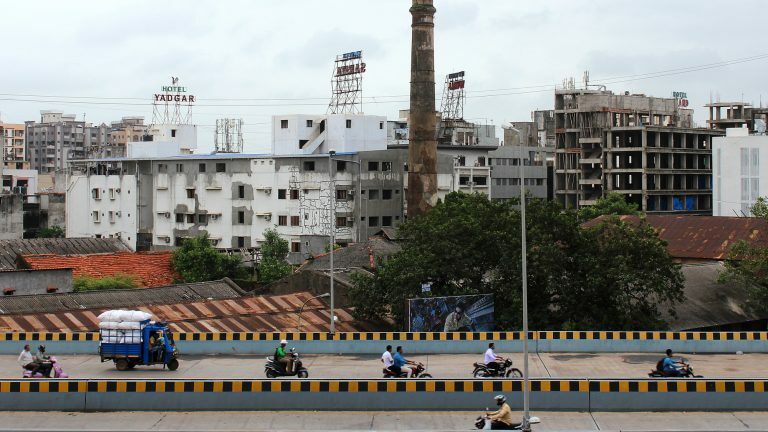 Surat, my random destination in India. There are two ways to use this method. The first one is relatively risk-free and I’ve used it several times: as I plan my RTW route, I look at cities that appear to be on my way. I do a bit of research and visit these cities if they seem alright and fit in my schedule. Then there’s the spontaneous way. That means making the same choice on the go and skipping the whole research bit. I did that in India when my train didn’t stop on my intended station. After that I looked at the map and decided to drop off at the next city that I saw. In that case, my random destination (Surat) wasn’t a very interesting experience. However, I was also sick the whole time and I didn’t have an internet connection, so that definitely affected my experience. Pros: A very flexible method that’s easy to apply. Cons: The destination isn’t completely random. The random circle that sent me to Kenya. This is what they do in the stories, right? The characters close their eyes, spin the globe on its stand and stick their finger on a random location. 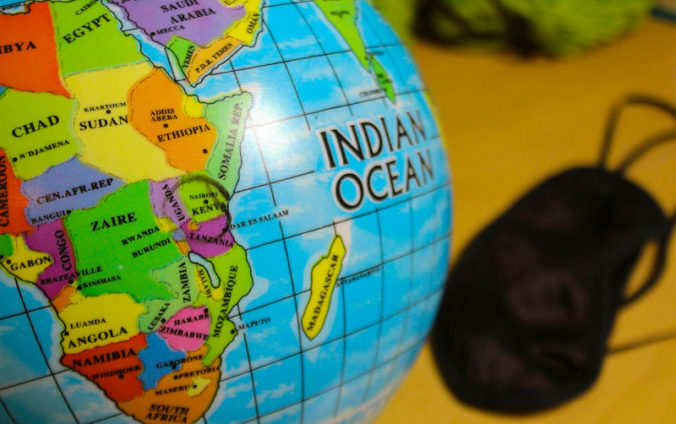 If you want to make this completely random, you need a globe that doesn’t have a stand. That’s exactly what I got before my trip around the world – a cheap kid’s beach ball with (a slightly outdated version of) the globe printed on it. I blindfolded myself, spun the globe in my hands and drew a random circle on it. The circle hit Kenya. It took me two years, but I finally reached Kenya last month. Pros: This is as random as it gets! Cons: Our planet is mostly covered with water. 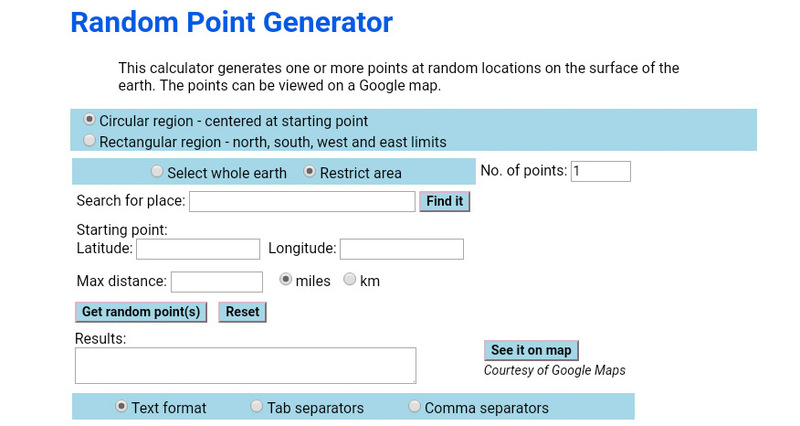 Geo Midpoint’s Random Point Generator, one of the many random destination generators online. There are lots of random destination generators online. Travel Spin chooses between “over 2000 great holiday destinations” while Earth Roulette picks a cheap flight from Skyscanner. For a 100 % random location, you can use Random.org’s Random Geographic Coordinates generator. Geomidpoint.com offers a similar Random Point Generator that even lets you limit your random destination within a certain radius of your starting point. If you truly want to commit to your random destination raffle, you should make sure you have to commit to your first result. Perhaps you could shoot a video of the lottery? Or maybe even live stream it! Years ago I heard of a traveller couple who’d pick random train journeys with a dice. The first throw would decide which train on the departure board they would take. The second throw told the amount of stops before disembarking. Using a dice or a coin or some other item can be a good way for instant randomizing. You only need to make up your own rules and your ready to go. Some people play with the idea of simply heading off into a random direction. All you’d need to do is pick a direction – like one from the compass – and follow it. The idea sounds clear enough, although the risk of hitting some obstacles on the way might be quite high. My Couchsurfing host in Kenya said one of his previous guests had done this in Russia. When the backpacker tried to follow his compass east, he ended up finding a top secret military base that had messed up his compass. Is that story true or not? I’ve got no idea. Besides listing different ways to choose a random destination, I thought I’d take this post one step further. Therefore I’ll finish with my own random destination generator. The “Pick a Destination” button will randomly give you any country in the world as your destination. The list of countries is taken from the US government website. Some results include links to my blog posts from those countries. Click the button if you dare!